Annan have laid a stake in the ground that they are very much in the kind of form which has made them favourites to make the play offs following an important victory at Links Park against their nearest rivals Montrose. Annan are on a superb run now having amassed four successive victories, the first time they have done this since season 2013/14 a run which has taken them into the driving seat to make the play offs as they enter the last quarter of the season. Rabin Omar marked his return the the starting line up with the opening goal. 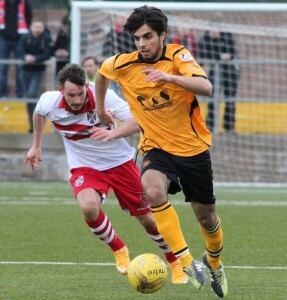 Annan boss Jim Chapman was forced into making one change from the team which defeated Clyde with the injured Peter Weatherson’s position up front being taken by Rabin Omar. After the long journey north it was surprisingly Annan who started the game on the front foot and swept to a half time 3-1 lead before Montrose pulled back an early second half goal. Annan then had Darren Ramsay sent off minutes later to hand the hosts the balance of power for the remainder of the match. It was a whirlwind start by Annan as they took the game to Montrose forcing a couple of corners in the opening minutes and in the 5th minute following one of the corners Annan got off to the best possible start when Rabin Omar struck a glorious shot from fully 20 yards over the keeper and into the top corner of the net past keeper Jordan Miller. Montrose replied two minutes later after Annan where cut open by a swift attack down the centre ending with the veteran Garry Fraser nipping in to tuck the ball into the corner of the net from 8 yards. It was an encouraging start by both teams and it was Annan who struck again in the 14th minute. Nathan Flanagan did well to create the opportunity for Rabin Omar wide on the left and Omar sent in an inviting low cross to the near post where Max Wright was quick to react to slot the ball into the bottom corner of the net. Annan continued to take the game to Montrose and in the 23rd minute they increased their lead after keeper Jordan Miller pulled off a super save to push Max Wrights net bound shot round the post for a corner kick. The danger however was not over and from the resulting corner kick Steven Swinglehurst showed good awareness when he lofted the ball over the defenders and keeper Jordan Miller to give Annan a 3-1 lead. Montrose were in a corner and they were presented with a glorious opportunity to reduce the leaway in the 34th minute when Jean Guy Lucas challenged Matty Smith on the edge of the box and the referee awarded a penalty kick but Blair Currie pulled off an important save to deny top scorer Gary Fraser. It was an important moment in the game and justice appeared to have been done, minutes later Fraser was booked for diving trying to win another penalty decision. Annan finished the half taking the game to Montrose and McKenna had a fine effort from 16 yards which went close. The second half started well for the home team, Gary Fraser’s free kick 25 yards out was an opportunity but the shot never really tested Blair Currie. Then in the 57th minute it was game on when Kerr Hay volleyed a super shot into the roof of the net when he connected with a cross from the left. Annan were then dealt a blow a minute later when Darren Ramsay was given a straight red card for a challenge on the edge of the box following what appeared to be a scrum down when Nathan Flannigan appeared to get muscled to the ground by a host of players and as one of the Montrose players came from the pack with the ball Ramsay went in to the tackle which did not appear to warrant a red card but the referee was well placed to call the decision. It did however hand Montrose an advantage and Annan were forced to rearrange, Tom Fry made his debut in an Annan shirt when the on loan Motherwell player was introduced at the expense of David McKenna as Chapman bolstered his midfield. Chris Templeton had a good effort in the 67th minute when he connected with a ball sent in from the right. Montrose pressed hard for an equaliser but Annan defended resolutely. Following a series of corner kicks and in the dying minutes of the match Blair Currie pulled off an important save from Templeton’s header to ensure another fine victory on the road from Annan. It was a day when Annan once again made ground on the three front runners who all had to be content with a point. Elgin and Arbroath fought out a no scoring draw and if Annan can achieve a victory at Galabank over Elgin next Saturday Annan will leap frog Elgin into third place. Top of the table Forfar had to be content with a point after a 2-2 draw at Clyde despite having keeper Grant Adam sent off in the second half. Stirling Albion sent another nail in the coffin of Cowdenbeath with a 2 goal victory which leaves the Fifers firmly rooted at the foot of the table. Edinburgh City’s match at Meadowbank against Berwick was postponed due to a waterlogged pitch. MONTROSE :Jordan Miller, Cammy Ballantyne, Andrew Steeve, Kieran McWalter (Liam Callaghan 64 MIN), Greg Pascazio (Callum McDonald ht), Michael Bolochowecky, Matty Smith (Graham Webster 86 min), Terry Masson, Gary Fraser, Chris Templeton,Kerr Hay. Subs not used Matty Allan, Dylan Thomas, Ross Campbell, Allan Fleming. ANNAN ATHLETIC : Blair Currie, Jean Guy Lucas, Jordan Stewart, Raffi Krissian , Steven Swinglehurst, Gavin Skelton, Max Wright (Aiden Smith 75 min) , Darren Ramsay, Rabin Omar, David McKenna (Tom Fry 61 min), Nathan Flanagan (Barry Cuddihy 86 min) Substitutes not used – Alex Mitchell, Smart Osadolar, Callum Home, Stephen Bronsky. Referee : Gavin Ross, Assistants Stephen Mitchell and Craig Wilson .